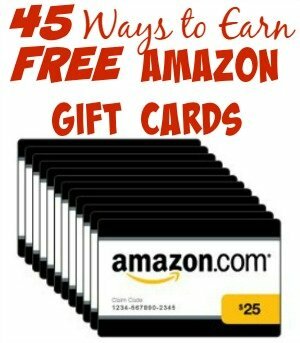 45+ Ways to Earn Amazon Gift Cards for Absolutely Free! 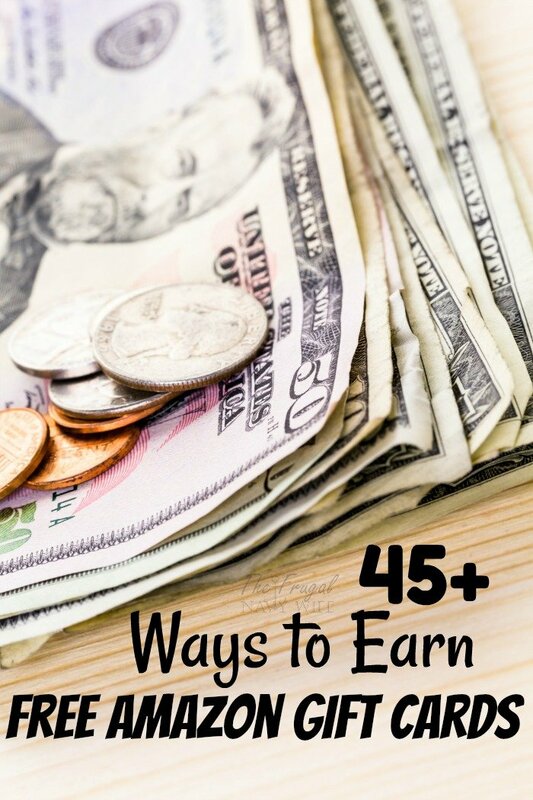 You Are Here >> Home » Frugal Living » Earn Extra Money at Home » 45+ Ways to Earn Amazon Gift Cards for Free! 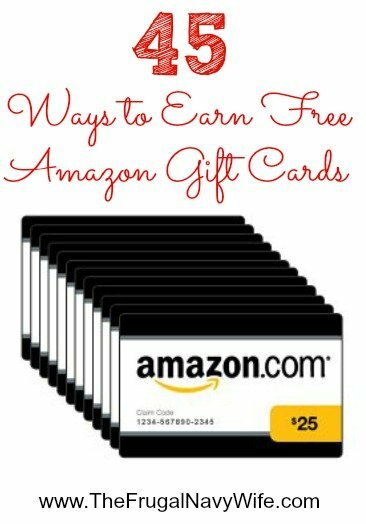 45+ Ways to Earn Amazon Gift Cards for Free! One question I get asked more than I can count is “Where can I earn Amazon Gift Cards for free?” Here is a list of 45, all of which I USE! 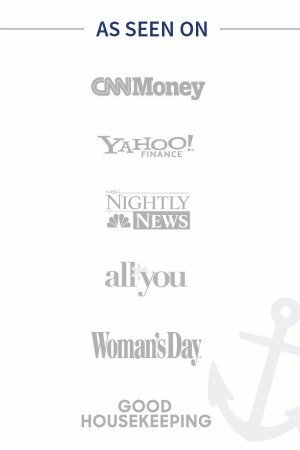 Some I use more than others like I use Perk Daily but ones like Ibotta and Shopkick are only used while I shop. Right now I am using the gift cards to help my budget out and I save them to get a free gift for birthdays and Christmas! The BIGGEST thing to remember: You should NEVER have to pay to join a site to earn money. If you have to pay 99.9% of the time it's a scam. So without further ado here is the LARGEST list online! See how I put these sites into play to earn an extra $210 a month to add to our budget! Make sure to pair these with our 30 hacks to save money on Amazon. Swag Bucks – This is the first option everyone thinks of and I want to cover it now. You earn points called ‘Swagbucks' for doing just about everything, searching the internet, playing games, watching TV and more. These can then be traded in for everything from Cash to electronics and Yes Amazon Gift Cards. InstaGC – When I signed up for InstaGC I did many of the site visits for points. Now I do more surveys here then anything. This site has many way to earn from signing up for offers, visiting sites, surveys, listening to music, fantasy sports games, and more. As their name says the gift cards are INSTANT. You click redeem and are given a code right then and there. They do tend to run out of some code so I save up for the bigger amounts. I just cashed in another $25 gift card from them! Grab Points – Is a little lesser know but still the same thing as Swagbucks but in a much easier to use site I think. I have cashed out for many free Amazon Gift Cards here as well. I tend to do my web searching with Swagbucks and use Grab Points for their games and newly added radio to earn points. Use code MQN9K1G when signing up for a bonus 500 points. iRazoo – Ok my # 1 reason for using iRazoo is they allow you to earn 3000 points a day watching Tv (which can be on in the background) and that is equal to $5 gift card a day! IF you did that every day (though not many of us can!) you would be earning $1,825 a year just from this one feature. I LOVE IT! Use code J2PWZ5 when signing up for bonus points. Perk – Earn points for watching videos, searching the Internet, playing games, and even browsing the internet. You can earn $1 a day just for turning on the videos and forgetting about them! CoinOut – This app was featured on Shark Tank and helps you claim spare change from your recipets and adds them to your account. You can cash our for PayPal and Amazon Gift Cards. Reward Shopping – Get paid to play the lucky button, stumble websites and more. App Down – Try out apps and get rewards like gift cards. This is an easy way to earn Amazon Gift Cards. AppKarma – Download the app and get paid to try out all sorts of different apps, mostly games, and get paid to do so. They also offer badges that give points for completing different things around the app. You trade your points for PayPal payout or Amazon, iTunes, or Starbucks gift cards and they are adding more every day! Use my link and get a bonus 500 points. My Points– My points has been around for a long time. The biggest thing with them is cash back shopping. They also so a lot of surveys for points.You trade your points for Amazon Gift Cards. Amazon Mechanical Turk – is a site run by Amazon. You won't make a ton of money here average is about $4 an hour doing tasks like categorizing pictures and such. You can be paid to your Bank account or to your Amazon Gift Card balance. Min. payout is just $1. For more details see Real Ways to Earn Money Online‘s in-depth description. Prize Rebel – This one is a lot like Swagbucks, and Gift Hulk, you earn the same way! Opinion Outpost – Opinions Outpost is a survey company known for doing products tests such as Kotex Pads and razors. They pay in many different ways and Amazon Gift Cards being one of them. Viggle – With Viggle you get points for checking in and watching TV (ANY SHOW!) you get bonus points for watching certain shows and now you get point for listening to music too! Check Points – (Use code Dani25am to get bonus sign up points!) This site you check into local locations for points. You can also watch videos for points. You can then trade those points in for a huge variety of gift cards including Amazon! CashCrate – Cash crate allows you to take Surveys and do offers for cash. They are one of the oldest company on the web that is still around! You can also cash out for Amazon Gift Cards. ePoll – This is another great survey site. Make sure to fill out your profile to get offers for surveys! You can cash out for Cash and Amazon Gift Cards among other ways! MySurvey – This was the first survey site I ever joined about 8 years ago back when they only paid by check. I am still most loyal to them and I love that now you can cash out for Amazon Gift Cards. If I only do one survey site this is the one! ClickPerks – A large rewards site. Earn for doing everything from reading email, shopping online, surveys, searching the web and more. Receipt Hog – Upload your grocery receipts for points you can trade for Gift Cards. Punch Card – Like Receipt Hog upload receipts from ANYWHERE and earn points towards Gift Cards like Amazon! American Consumer Panel – This is another survey site that I have used and recommend. Amazon Trade In – Trade in books, movies, and games for Amazon Gift Cards. Tellwut Surveys – Take surveys for credit to use to for gift cards. FusionCash – Earn from Surveys, watching videos, paid to click links and more. Mindfield Internet Panel – Some surveys pay Amazon Gift Cards. Quick Rewards – Get paid to do almost anything! Reading emails, taking surveys, shopping and more! Recycle Bank – They sometimes have Amazon Gift Cards as offers to trade your points in for. Top Cash Back – Cash Back for shopping, many freebies! Get your Cash Back as Amazon Gift Cards! Ipsos – Take survey's and get Gift Cards back! (make sure to confirm your email and fill out your profile!) They also do paid product testing where you receive free product to try out and get paid to give your opinion on it. Listia – List your old junk and get Amazon Gift cards in return. Ibotta – Get rebates from grocery shopping and earn Amazon Gift Cards along with cash outs to Paypal! You are already spending the money why not get free Amazon gift cards back. Fetch Rewards – Use invite code: H6QUE for a special reward. Like Ibotta get points as a rebate when buying certain items. Turn the points into Amazon or Visa gift cards and other items. mPoints – mPoints is a group of apps that all use the same points system. Get points for reading the news, playing games etc then trade in for gift cards. Global Test Market – While many people this of this as a survey company they are known just as well for their products tests as well. Hence their name. Test products, get paid in several ways, including Amazon Gift Cards. National Consumer Panel – NCP is run by Neilson and know as the scanner company where you scan in your groceries and earn points for household items and gift cards. Saving Star – Like Ibotta you earn cashback on grocery purchases. 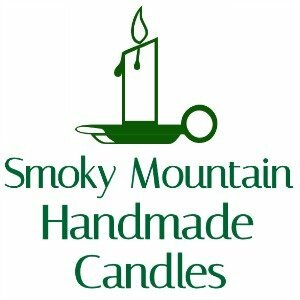 They are known for their freebie Friday where they offer 100% cash back and a certain item for the weekend. Survey Downline – Another survey company that people are talking about in a good way if you are into taking surveys! Check out Amazon Prime Perks – 30 Hacks to Save With Your Amazon Prime Membership to make those gift cards stretch as far as possible! I also want to point out one of my favorite ways to make money at home is via blogging! See what you need to know to get started blogging. That’s a good list of places. I use media insiders for sure. I use to use viggle too. That’s really good list ..!! Nice compilation! Will most definitely be signing up for some of these. It’s really great for Amazon gift cards. Every week you review songs for the radio and then they email you $5 Amazon gift cards. Super easy. OK… gotta ask. How do you earn points watching TV on iRazoo? No I don’t remember that site. If you happen to think of it please let me know. almost all of the sites are for uk/us residents there isn’t much for uae residents how can we get points and gift vouchers? Also try chicago rewards! I’ve earned over $200 in target cards in 3 months! what is the exact website for Chicago Rewards please? Is Louder rewards. Theres an app for every major sports team. Download or a dozen. You can cash out for sports gear for your fav teams, or gift cards to amazon, target, walmart, hone depot + many more. I redeemed my gift card after two days and received it in 8 hours. Where’s prize rebel, i made 60 dollars within 3 weeks. I haven’t used them but will have to check them out. I’m excited to try out the others; I’ve only ever used Swagbucks, and I am LOVING that!! I do have a question though…why do you have some of them crossed off? Since i wrote this post a few sites have closed down I am looking to replacements on them! As a stay at home momma, i love using Quick Thoughts. It is amazing. Ive eaned nearly $100 in just about 6 months. Its simple and easy to utilize. I cant wait to try these other sites! Keep checking back I’m always updating as I find more places. You’re an amazing woman for sharing all of this information. I just wanted to THANK YOU! Thank you for your family’s service to our country! Stay safe! Nice list, I am also using amazonscope.com for quick searches when I want.